Digitalization is key to increasing productivity and competitiveness in the manufacturing industries. It is also creating completely new business and growth opportunities for companies, as well as new jobs. 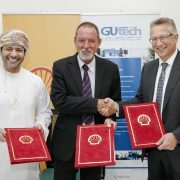 To train the engineers of the future and to strengthen the collaboration between industry and academia, the German University of Technology in Oman (GUtech) and Siemens have announced a new academic collaboration that will provide advanced learning and certification opportunities for engineering students and professionals. Beginning 2018, GUtech will offer the Siemens Mechatronics Systems Certification Program (SMSCP) to all students interested in advancing their skills in automation and manufacturing. Announced at a signing ceremony hosted at the GUtech campus in Halban, Muscat, the partnership is designed to boost students’ digital skills to meet the needs of an increasingly-digitalized industry sector. The signing was witnessed by the German Ambassador to Oman, H.E. Thomas Schneider, as well as other business leaders and academia experts. Mechatronics is the combination of mechanical, electrical and computer engineering integrated to build complex systems. This holistic, hands-on approach to engineering can improve efficiency, productivity and quality and ultimately decrease time to market. Industries that benefit greatly from mechatronics systems include aerospace, materials processing, water desalination, machine building, automotive, transportation, building technologies and mining. Siemens is the only global industrial company to offer the internationally-recognized program in cooperation with partner colleges and universities throughout the Middle East, Europe, North America, Asia and Africa. Under the agreement, GUtech will be the first university in Oman to offer the training and join an international network of advanced technology partners in education and industry working with Siemens to deliver the SMSCP program. Upon completion of the program, participants will obtain mechatronics systems certification directly from Siemens. The course will be offered to students in two levels, and taught by the GUtech’s instructors who will be trained at the Siemens Technik Academy in Berlin, Germany. Each level is based on a job profile – a comprehensive description of the tasks that the certified individual should be able to perform. Job profiles are developed by Siemens in collaboration with other industry and public sector partners. HALBAN The German company PSI Software Group has opened a specialized Computer Laboratory and Training Center at GUtech, located in Barka. The University and PSI Software Group signed a MoU a few months ago. “We are delighted to open a specialized PSI Computer Laboratory at our university today. GUtech students who are enrolled in Mechanical, Process and Environmental Engineering will benefit from this unique laboratory as well as our academic staff. To familiarize themselves with the SCADA software the Engineering professors of GUtech were trained at the PSI head offices two months ago,” said Prof. Dr. Ing. Michael Modigell, Rector of GUtech. 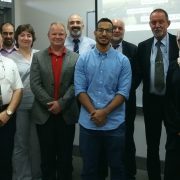 The PSI Software Group will also utilize the GUtech laboratory as a Training Center for its customers in the GCC region. “The PSI Control system will be introduced from January onwards. We are looking forward to training GUtech students in the simulation of the operation of gas and oil pipelines and water networks. Our software with an extended technology simulation core specifically helps to understand better the fluid transportation process within a pipeline. Therefore, it is a high-end tool to increase efficiency and safety of pipeline operations,” said Wolfgang Klüber, PSI Sales Manager Oman. PSI also plans to introduce an internship programme for the best Engineering students at GUtech. ““We want to train our students in specialized laboratories that give them the skills to implement the practical experience in their future work. Therefore, offering an industrial software like PSI’s SCADA in our engineering programmes will give the opportunity to our students to be trained in Energy Management and Oil and Gas Pipeline Management. Also, this will enrich the engineering programme,” said Prof. Dr. Najah Al Mhanna, Head of the Engineering Department. The PSI Software Group is the European market leader for supervision and control systems for gas, oil, electricity, heat and energy transmission and trading. PSI Group develops and integrates complete solutions for energy management (gas, oil, electricity, heat, energy planning, transmission, and trading), production management (mining, metals, automotive, mechanical engineering, logistics) and infrastructure management for transport and safety. The PSI was founded in 1969, it is based in the German capital Berlin and employs more than 1,600 persons worldwide, in projects in the US, Europe and Southeast Asia. Previous prestigious projects in the area of gas management applications include such ambitious and sophisticated installations as GAZPROM control systems for the onshore gas transmission pipeline system supporting Nord Stream and for the entire onshore/offshore gas Blue Stream Pipeline System in Russia. On the Arabian Peninsula, PSI has delivered the leak detection and location system to the Kuwait Oil Company, for its countrywide gas and condensate pipeline system. Caption: Group photo with Prof. Dr. Ing. 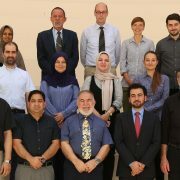 Michael Modigell, Rector of GUtech (second row, center) and Prof. Dr. Najah Al Mhanna, Head of the Engineering Department (second row, right), Dr. Aleksej Lisunkin, Technology Development Manager of PSI (first row, center) and Rüdiger Schulz, Business Development Middle East/Oman (second row, center), Elena Lvova, Project Software Engineer of PSI (second row, left) as well as GUtech professors and engineering students. MUSCAT Shell Oman organized a special ceremony today at the Oman Convention and Exhibition Center to recognize the two student teams from Oman that represented the country during the Shell Eco-marathon Asia 2017 held in Singapore in March this year. GUtech teams have been participating in the competition since 2014. 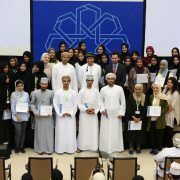 Since that year a total of 65 students from Oman participated in the annual competition. 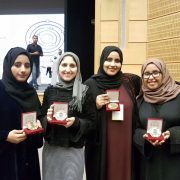 This year the teams from GUtech and Sultan Qaboos University competed with their eco-friendly and fuel-efficient cars among 120 teams from Asia, Middle East and Australia. 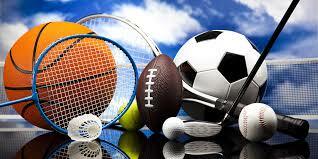 Oman Air sponsored the transportation of the vehicles and the flight tickets of the teams. Supervisors: Prof. Dr. Emmanouil Bouzakis, Prof. Dr. Najah Al Mhanna (Engineering Department of GUtech) and Ali Al Humairi (Computer Sciences of GUtech). 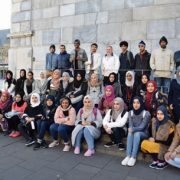 The Engineering Department at GUtech organizes an excursion to Germany every year so in September 2017, 36 Semester 7 Students from the Process, Environmental and Mechanical Engineering Degree Programs of the Engineering Department at GUtech, will travel to Aachen in Germany to complete the Measurement Techniques Laboratory Course and to go on some Industrial Excursions to see the Industry in the surrounding area. Dr.-Ing. Najah Al Mhanna, the Head of Engineering Department, has been coordinating and organising the excursion since 2015. His aim is to give the chance to the engineering students to participate in practical courses and to visit some well-known companies in Germany. This Trip is being funded by the Engineering Department at GUtech and DAAD (German Academic Exchange Service). Dr.-Ing. Najah Al Mhanna, the Head of the Department of Engineering, will accompany the students during the first week which is planned to be for the industrial excursions. The Students will be supervised throughout the trip by Dr. Hind Barghash (Assistant Professor), Dr. Roghaieh Parvizsedghy (Assistant Lecturer) and Dr. Thomas Lattimore (Research Assistant and Coordinator for the Department of Engineering). This experience will provide Students with first-hand experience of the German University-Level Education system and it will provide them with some experience of Industry in Germany. In addition, it will help them learn more about the German and European Cultures. Overall, it is hoped that this will strongly encourage these mid-high achieving Students to pursue Masters and PhD studies in Germany and Europe once they graduate from GUtech. (Below: picture from last year’s trip in October 2016). 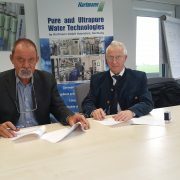 HALBAN The German University of Technology in Oman (GUtech) has signed a Memorandum of Understanding (MoU) with HARTMANN LLC, a German company, specialized in membrane technology for water treatment . “We are pleased to sign the agreement with Hartmann so that our Engineering students can learn how water treatment systems are functioning and how the systems are operated,” said Prof. Dr. Ing. Michael Modigell, Rector of GUtech. The University and Hartmann LLC. agreed to collaborate on establishing a training and research facility at GUtech. “We will equip GUtech Engineering laboratories with Water Treatment Technology from Hartmann, in order to assist the students and enrich their knowledge,” said Dieter Hartmann, Managing Director of Hartmann Technology LLC that was founded in 1983 and has grown rapidly since then, employing a total of 67 employees. In addition, Hartmann will offer internships and training support for GUtech students in their main offices in Germany. The additional purpose of the collaboration will be a close relationship for educating GUtech students in water treatment technology and to train Hartmann customers from the GCC region at the GUtech facility. The company has several customers in Abu Dhabi. GUtech offers BEng programmes in Process Engineering, Mechanical Engineering and Environmental Engineering. As part of the study-programme all students have to conduct internships. SINGAPORE The Megalodon team from GUtech is preparing their car named ‘Diesel Meister’ for the Shell eco-marathon Asia 2017 at the Changi Exhibition Center in Singapore. 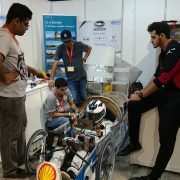 A seven-member student team participates in the diesel category. GUtech participates for the third time in the Eco-marathon. For the first time Al Shifa Al Hadi, an Omani female Computer Science student will drive the eco-car. On Saturday the Megalodon team successfully passed the inspections. Last year, after passing all technical checks the students drove a specific fuel consumption of 0.6 l per 100 km.